When we first moved to Florida in May 2002, I joined the Confectionary Artists Guild of Orlando (CAGO). I started learning cake decorating as a scout badge when I was 12 and by the time I moved to Florida, I had professional-level skills. CAGO does cake demos at the Central Florida Fair every year. They usually have an entire weekend afternoon of demos from the stage in the Creative Arts building. CAGO members do back-to-back 1/2 hour demos on a variety of cake-related skills. I did a demo every year for three or four years. When the Fair was looking for people to do cooking demos, they asked CAGO if any of our members wanted to do that. I volunteered, and did vegetarian cooking demos for a couple years in addition to the cake demos. Then I started law school in fall 2007 and life got pretty crazy. I hadn’t been to the Fair since. Until yesterday, when I spent the morning at the fair, doing spinning demos in the Weavers Guild of Orlando booth. Bev demonstrating on the floor loom and me spinning. The Central Florida Fair is only open in the evening on most weekdays. On the first Friday morning of the fair, they host a Kids’ Day for school groups, homeschool groups, and families. Each group gets a guide from the fair in addition to the chaperones from the school. The guide brings the group through the open sections of the fairgrounds (the midway isn’t open, but creative arts and the barns were; not sure about other buildings). In the creative arts building, most of the guild and club booths had a person in them to do a demo. Some had make and takes or a hands on activity. In our booth, we gave a brief talk about how clothes are made. Bev talked about the difference between knitted and woven fabrics, pointing out examples from the clothes kids were wearing. Then I pointed out the $5 Mystery Fleece, fluffed out on the table behind me and the bag of seeded Pima cotton (in a bag just behind my right shoulder in the picture above). I explained that these were in raw form, that they were then cleaned and formed into a continuous tube of fiber, and that in order to make yarn those tubes of fiber have to be thinner and that’s what a spinner does. After we did our short explanation, kids got a chance to weave on the floor loom and to make Kumihimo braids with guidance from my friend V. (That’s V.’s foot in the right-hand edge of the picture above; she asked me not to post her picture). V. is not a fiber-crafter (yet!) but she’s staying with me and she tagged along to the fair to help wrangle kids. At the beginning of the day, Bev showed V. how to do Kumihimo braids. She picked it up quickly and did a great job teaching kids how to do it too. The bucket is half full of bobbins. 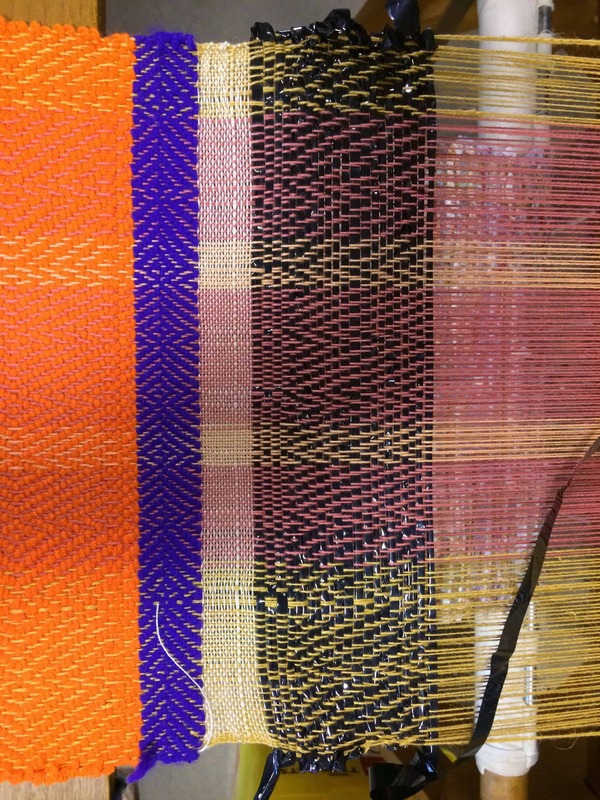 Kids could pick their favorite color and use it to weave. One of the bobbins in the bucket (on the shuttle in the picture above) was loaded with VCR tape. Bev had several small woven pieces and a finished bag that included VCR-tape weft. I was surprised by how pretty it was. The tape tends to take on the colors of the warp or other surrounding fibers, adds a pretty sheen to the fabric, and the draft pattern stands out beautifully against it. Bev also brought some samples woven with plastic grocery bags or Cheesecake Factory to-go bags. All the pieces were beautiful, and I wouldn’t have guessed the material. I obviously need to expand my thoughts on appropriate materials for weaving! There’s a lot more than just yarn. Close up of the VCR-tape weft. I started a new fiber at the fair — Cormo for my first of the Breed-Specific Spinning Project. For the first few groups of kids, I just spun and answered questions. No one touched my wheel. One of the kids in the fourth group asked if she could try it out, so I sat her down at the wheel. I’ve only been spinning for 10 months now, and have only spun about 3 pounds of fiber. I’m nowhere near an expert and haven’t taught anyone else to spin. I discovered that I don’t have a good vocabulary for explaining what is happening when you spin or for verbally communicating the process to a student. After that first kid, I didn’t let anyone else sit and try all the steps at once. I mostly let kids (even as young as 4) hang onto the roving and pull on it a bit, while I treadled and kept my left hand pinched firmly around the point of the twist. The resulting fiber was over twisted, thick and thin, and broke a couple of times. But so what? Kids got to touch fiber and were pretty excited about it. 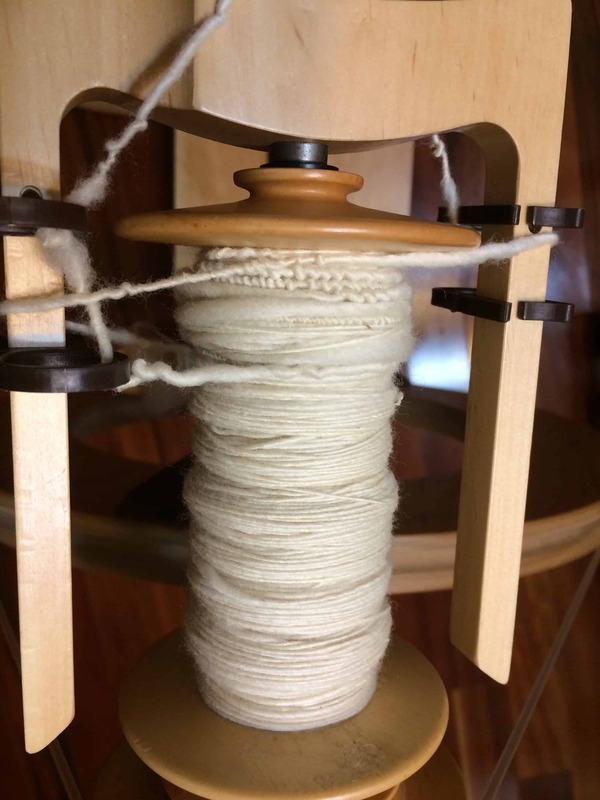 I learned that I have a lot to learn before I can effectively teach spinning and that the technical details of spinning are not firm enough in my own mind. If they were, I’d be able to explain them! The Central Florida Fair runs February 26 – March 8 this year. During the week, they are open evenings 4 pm or 5 pm until 10 pm. On Saturdays and Sundays, they are open 10 am to 10 pm. 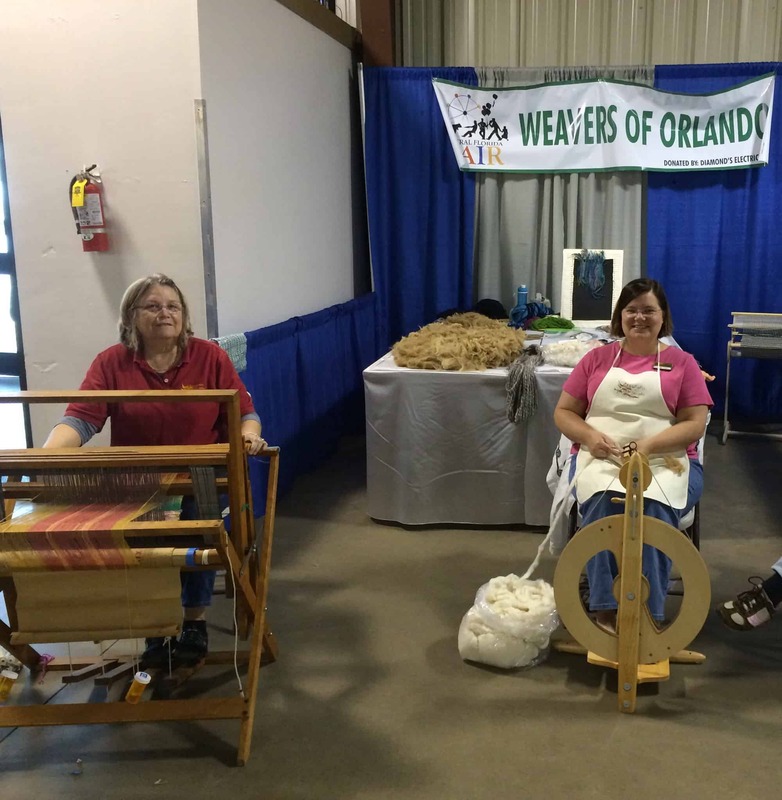 The Weavers of Orlando are staffing our booth on weekends, but may not be there on weekdays. I can’t be there again this weekend, but might be there next weekend. If you are at the Fair, stop by and say hi to the weavers! 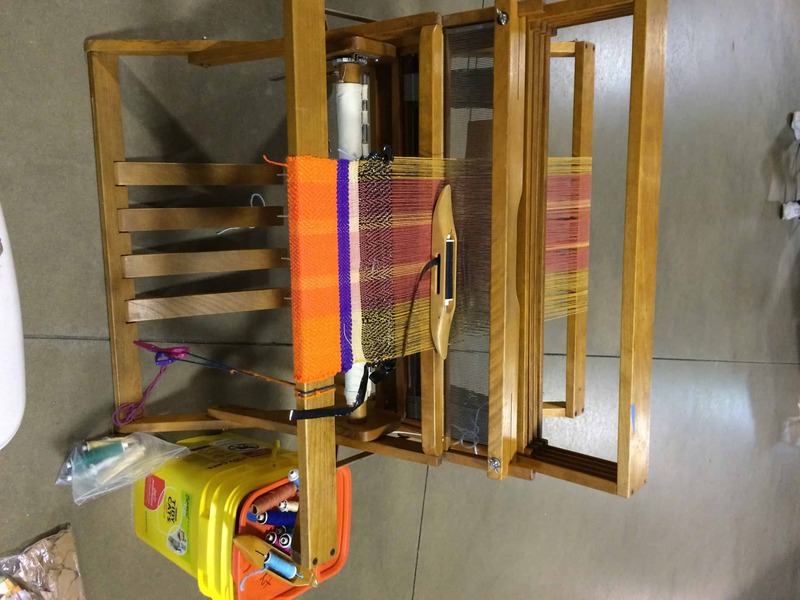 Anyone can try out the floor loom; it’s not just for kids! Very interesting to read of your initial participation with cakes and your current work with fiber. The common thread, Ahem, pardon the pun, is your creative and free spirit! I expect you will have that remedied soon! It is just too much fun for her to resist for long. Plus, it is so soothing once you get past the first fits and starts. I taught her to knit yesterday! I like to start people off with a garter stitch dishcloth knit on bamboo needles with Knit Picks Cotlin yarn. I stock up on needles when a local craft store has them on sale and pick up a few skeins of Cotlin whenever Knit Picks has a sale. I showed her the knit cast on, and had her cast on the 42 stitches for a dishcloth. Once a person’s cast on 42 stitches in this manner, it’s pretty easy to show how you knit from there. After she was finished casting on, we went to knit night at the LYS. In the 3 hours we were there she got 4 rows knit. Everyone was commenting on how relaxed she seemed! No hunched shoulders, no aggravation or expressing a desire to throw the knitting across the room. Just focused on making stitches — and doing a good job of it!